Kreative Joose: TBRindr — An Indie Author and Review Matching Resource! 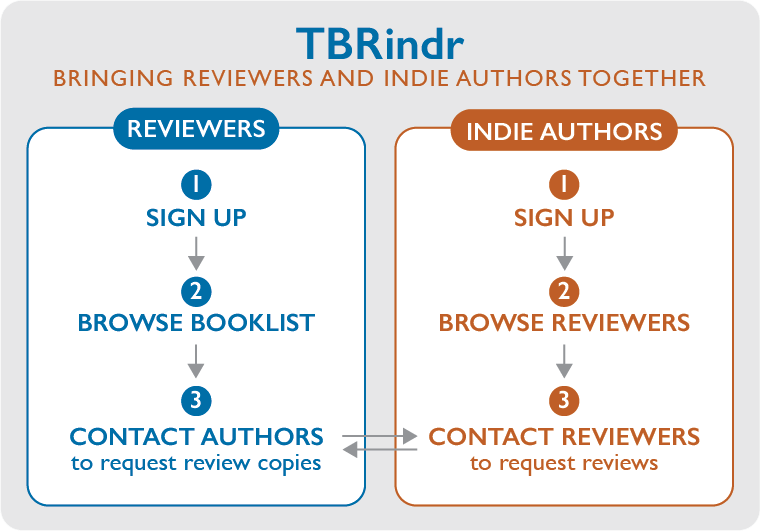 TBRindr — An Indie Author and Review Matching Resource! TBRindr. What does this collection of letters mean? It's a set of databases for indie authors and reviewers who are accepting indie books! It's been a great asset to the self-published fantasy community, but its founder has retired from blogging. So to keep it open and available, I've agreed to take over its day-to-day management. The database sheets exist exactly as they were, so anyone who is currently signed up does not need to sign up again. Any participants who have suggestions for improvements, please comment or message me. A huge obstacle indie authors have to conquer is getting a decent amount of reviews on both Amazon and Goodreads. The number of reviews a book has impacts its visibility, especially on Amazon. The self-published fantasy scene is thriving and vibrant, and the best way to encourage these talented authors is to have an accessible review service geared toward them. Ideally, reviewers and authors will go through each others info thoroughly and look for high matches, with multiple preferences checked off for each of the books being recommended or requested. After you sign up, browse the database of books and contact authors to request review copies. It doesn’t matter if you have your own blog with a ton of followers or have no blog and just post an Amazon review. To Amazon, a review is a review and it helps a book's visibility. You get free books, indie authors get reviews! If at any point you don’t want to do this anymore, or are busy and need to catch up, all you need to do is message me on Reddit, Twitter, Goodreads, or Facebook and I’ll either take down your info or place you on ‘hold’ status. At the end of the year, we'll be giving prizes for the highest number of reviews completed, and a few random prizes for participating. 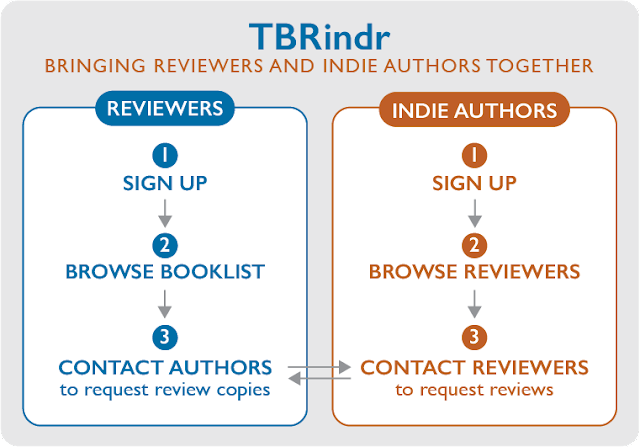 So, reviewers, be sure to email me links to your reviews and use #TBRindr as much as possible! Self-published and small press SFF authors are welcome to join. Once you sign-up, reviewers can find and request your book. However, this is a two-way street! We recommend you browse the database of reviewers and contact those who might be interested in your book. As you can see, there are preferences for a number of sub-genres, so you can find the right readers for your story. Although the idea is to get reviews, I will not be hounding people for reviews. We'll be working on the honor system here. That said, if a few authors alert me to someone who looks like they are just in this to get free books without putting out any reviews, I’ll put that reader’s info on hold status until some reviews come out. Also, please do not send review requests for anyone who has a ‘hold’ status, even if they sound like the perfect match for your book. Hounding the reviewers will get them to quit, and this whole thing won’t work anymore. As a general tip for authors, when you send a request, personalize it and make sure you've gone through the reviewer's preferences thoroughly. I love this! Fan for life!